Architecture and construction are governed by changes in technology - style comes about after the change in how we can build. I have seen the changes caused by the end of old growth lumber and the introduction of engineered lumber. I remember when the first machine that could cut granite counter tops was set up in town. I saw how the ability to make inexpensive mouldings out of finger-jointed wood or mdf changed window and door casings, and changed our clients' expectations. So I want to think about how the development of technology we now take for granted (wire screens) or see as eye candy ( shutters) has impacted design. And how people were inventive as they came to understand what the technology could do. When I give the tour at the Historic Park-McCullough House, and I talk about this stuff, people are fascinated - they love knowing how The House works. So I need to be accurate, not just hypothesizing. I'm also interested because screens and shutters are examples of green technology and design. They can be made from renewable resources. They don't use fossil fuel to operate. They can be adjusted for the weather. They can be repaired without fancy tools. And they will not be obsolete because 'they' don't make the part anymore. I also love to learn about how people have interacted with their spaces. 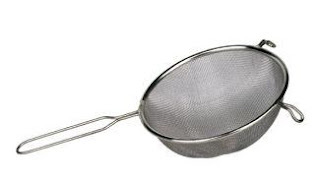 I share the enthusiasm of the visitors to The House - I think it's fun to imagine being the first person to turn a sieve upside down and recognize that it could keep flies off the food. Or to realize that, of course, mosquitoes don't bite when there's a breeze, so how do we make a breeze? Wow, you have been busy developing this website/blog, as can be clearly seen. Sure know that we will be checking in on it and reading many of the subjects on a rainy day. Whoops, that means now, I guess.